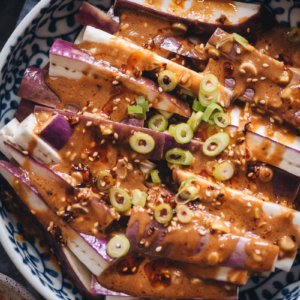 Over the years I’ve gotten plenty of readers’ requests asking about creating more vegetarian Chinese dishes. 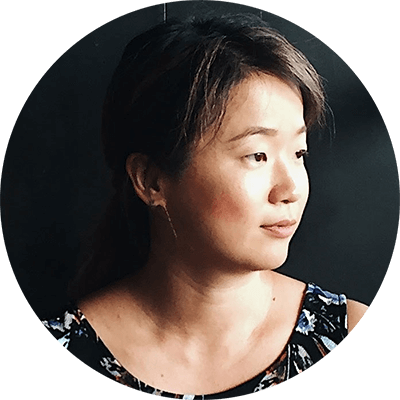 I often reply hesitantly and said it’s very challenging to make it happen. You see, traditional Chinese food is always big on vegetables and grains; the focus has never really been on the meat. However, almost 90% of the dishes use some sort of meat or seafood as a flavor enhancer. For example, a big plate of fried green beans uses just a spoonful of ground pork; a hearty spinach dish is cooked in chicken broth; a simple soup is cooked with a few dried shrimps. 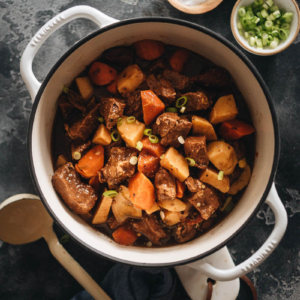 Or a beautiful vegetable stew might be cooked in a rich pork sauce. 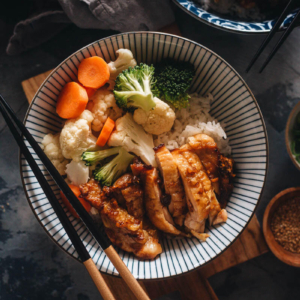 That was the only way I knew how to cook Chinese food; it never crossed my mind how to turn them into vegetarian dishes. Last year when I traveled back to Beijing, I was surprised to find my favorite Dim Sum Chain – Jin Ding Xuan (金鼎轩), had just opened a vegetarian branch. The store’s name is “Be Well” (善在), which gives it a hint of zen. It’s funny that at first, I didn’t even realize the place served vegetarian food. Browsing through the menu, we were thinking “hmmm, the dishes look different and a few things seem to be missing…” It was only when I asked the waitress about my favorite shrimp dumplings that she told me that the restaurant had changed to only serving vegetarian food. What’s interesting is that the dim sum menu actually looked perfectly normal. That’s when it dawned on me that it is very possible to make many Chinese dishes vegetarian. If a famous dim sum chain whose previous menu contained meat in almost every dish can do it, I can as well. So here it is, an authentic-tasting vegetarian chow mein I created in my American kitchen. 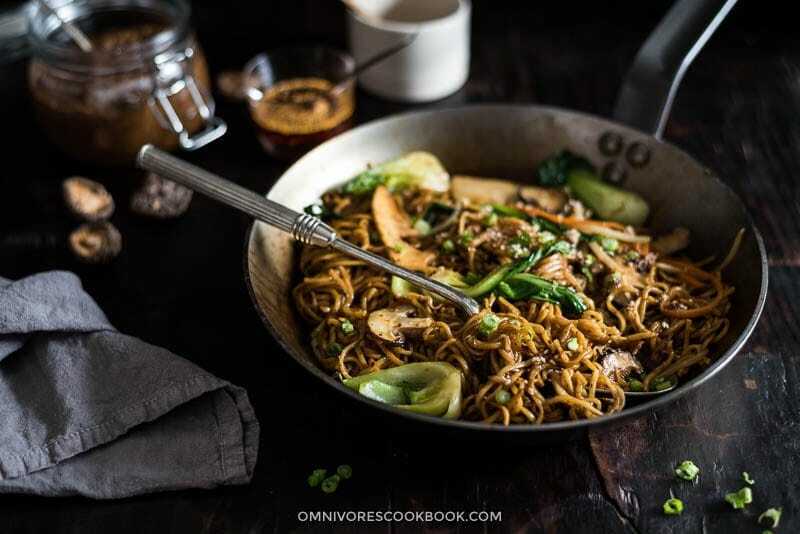 When my husband asked me if this dish is authentic Cantonese, I replied “I have no idea!” … if you research the dish on Chinese recipe websites, many so-called vegetarian noodles contain pork! 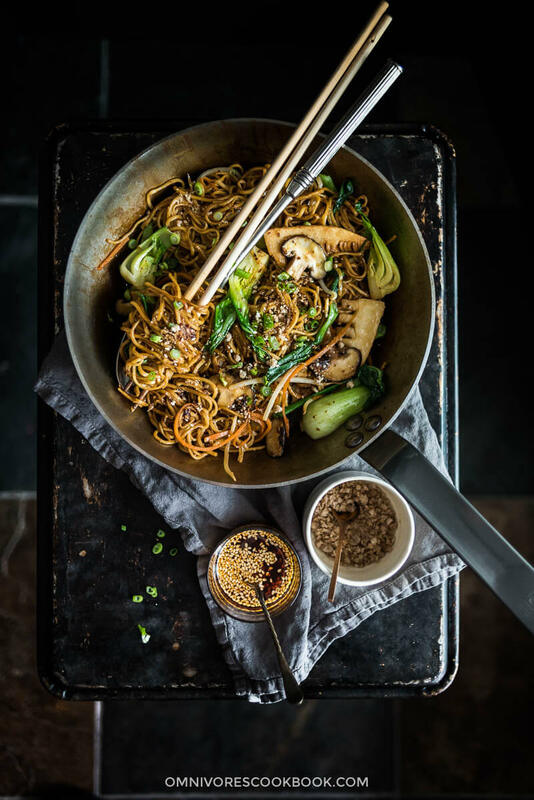 In this version, I used the homemade vegetarian oyster sauce which gives the chow mein sauce a rich umami zing that I swear is as good, if not better, than the non-vegetarian version. At the end of cooking, I tossed in some homemade chili oil to give the dish an extra kick. Not to exaggerate: this one tastes so amazing that I feel even I could follow a vegetarian diet. (1) This dish is highly versatile with the vegetables it uses and you can tweak it with whatever you have at home. Just cook them according to their texture so everything will be done at the same time. The only thing to remember is less is more, so do not add more than 6 cups of vegetables. (2) Toss the boiled noodles with some oil in the hot pan before mixing the sauce and vegetables, so the noodles won’t turn to a soggy mesh. You will consume a bit more oil in this case, but this is how Chinese restaurants make such heavenly chow mein. By tossing the noodles with oil, the boiling water will evaporate, the noodles will char a bit and separate more easily. 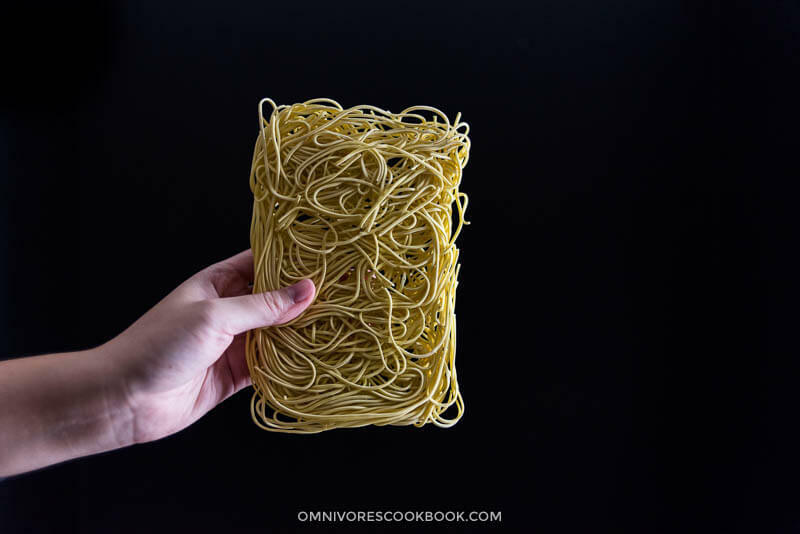 (3) A quick trick to make tossing noodles easier without entangling everything – use a pair of kitchen shears to cut noodles into shorter chunks. (4) Never cook too many noodles at once. 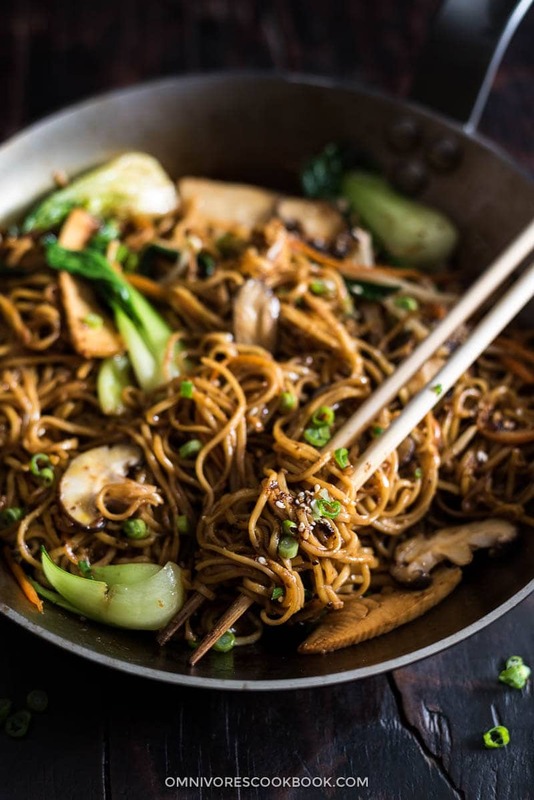 I wouldn’t cook more than 6 ounces dried noodles in a large skillet (11” to 12”) and more than 8 ounces noodles in a large wok (14”). If you need to serve more people, cook the noodles in two batches. (5) Many types of noodles work in this dish. 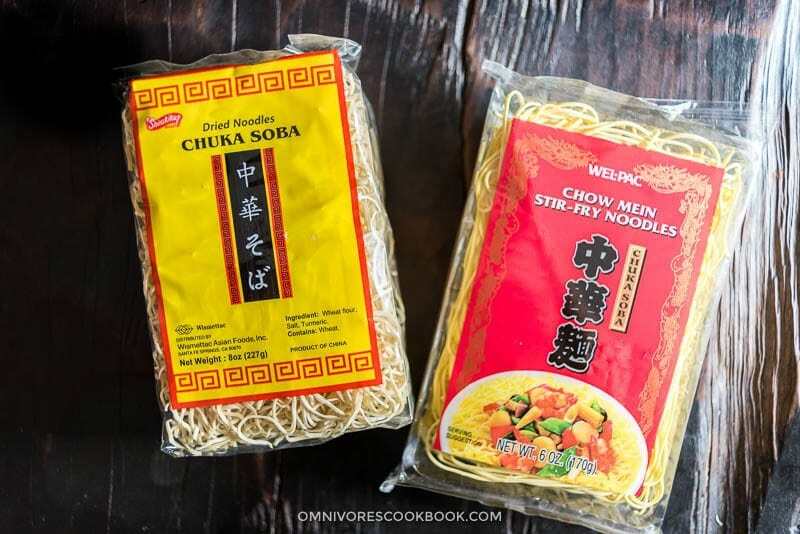 The top choice is the dried noodles labeled as “chow mein noodles” (the yellow color comes from turmeric, not egg) or “Chuka Soba” (which is made with wheat flour and unrelated to Japanese buckwheat noodles). You can also use thick dried Udon noodles, or even spaghetti. For a gluten-free alternative, use dried rice noodles or shirataki noodles. (6) Do make some chili oil and add it to the noodles if you like spicy food. It’ll take your dish out of this world in no time! 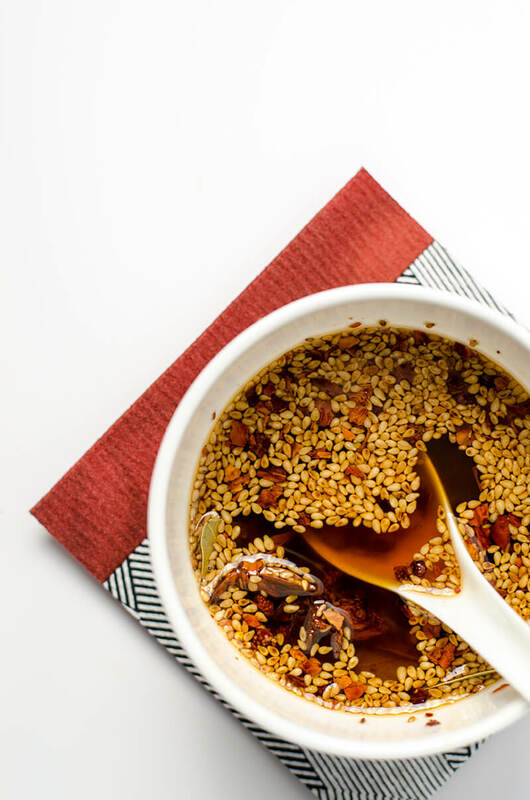 Chili oil stays good for months in your fridge and it’s always a great thing to have on hand. Cook noodles according to the package instruction. Drain and set aside. Combine all the sauce ingredients in a bowl, stir to mix well. Heat 1 tablespoon oil in a large skillet over medium high until hot. Add carrots, shiitake mushrooms, and baby bok choy. Sprinkle with a pinch of salt. Cook and stir for 1 minute. Pour in 2 tablespoons water. Cover the pan and let steam for 30 seconds. Transfer everything onto a big plate. Add the remaining 2 tablespoons oil and ginger. Stir a few times to release the fragrance. Add noodles. Toss the noodles with a pair of tongs until the edges turn a light golden color. Add more oil if the noodles stick together. Return the cooked vegetables to the pan. Add bamboo shoots, bean sprouts, and green onions. Pour in the sauce. Toss until the sauce is eventually mixed and absorbed. Remove the pan from the stove. Swirl in sesame oil (or homemade chili oil). Toss again to mix well. Transfer everything onto a big plate. Serve hot as a main. 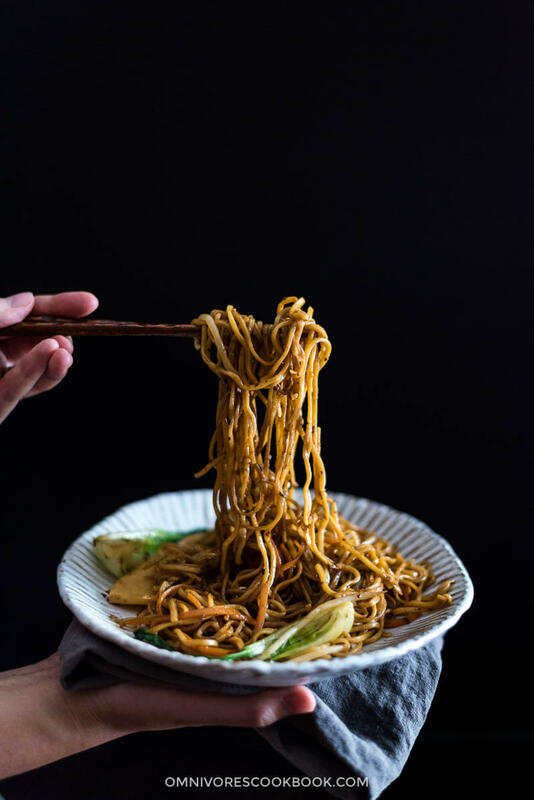 As I mentioned in the blog post, you can use chow mein noodles, or any type of thick wheat noodles. Alternatively, you can replace it with rice noodles for gluten-free and shirataki noodles for gluten-free and paleo. Hi Maggie, Greeting from another Chinese blogger (brand new)! Discovered your site since I started my own blog. Adore your blog! So professional and inspirational! And like your photo style too. I’m from Gansu and lived in Beijing for many years before I came to Europe. I used to eat at Jin Ding Xuan a lot (the one near Yong He Gong) with my colleagues after work (around 1 am) because it was one of the few good restaurants which opened 24 hours. This post reminds me of those sweet memories…. Anyway, very pleased to meet you (would like to meet you one day in person). Ps, Thank you so much for your trick on hiding long Pinterest images. Have a great day! Hi Wei, sorry it took me forever to reply your message! Gosh I just realized it had been a month since I reply my blog comment last time. I’m glad to hear you have passion about Chinese food too and would like to share it with the rest of the world. I’ve never been to Gansu before, but I believe you have great noodles there? These days I’m very bad at blog commenting, but I’ll follow your blot and promote it for sure! Thank you very much Maggie! Yes, there are so many great noodle dishes in North-west of China. I saw you wrote about Lanzhou Beef Noodles before. That was my regular breakfast when I was a teenager! Anyway, have a great weekend! In Cal. we have a place called THE RICE BOWL it served great chow mein using mostly bean sprouts. T Obama’s demanded the thicken sauce be left out/. It became only steamed vegies. Can you tell me w hat the sauce might be? I love vegetables as we were raised with a garden every year. I am so excited with all your information. My family would LOVE this! Yum! I’m glad to hear you like the recipe! Yes, you definitely need to add more oil to the dish if using a cast iron pan. I found starchy food such as noodles will stick to the cast iron pan very easily. Chinese restaurant uses the same trick too, to prevent from sticking and makes the noodles tastier. Hi Maggie! Greetings from Oklahoma City. We have enjoyed every recipe of yours that we’ve tried. I just had to comment on the photograph for this dish. It is umame for the eyes! If I wasn’t already vegan, I would want to be one because of this beautiful dish. Thanks for all of your hard work . You inspire me with every post! Hi Maggie. 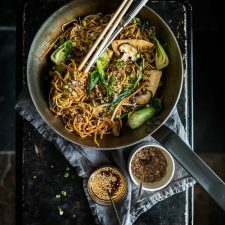 I made the vegetarian chow mein last night for dinner for me and my husband, the very first recipe I tried from your site! 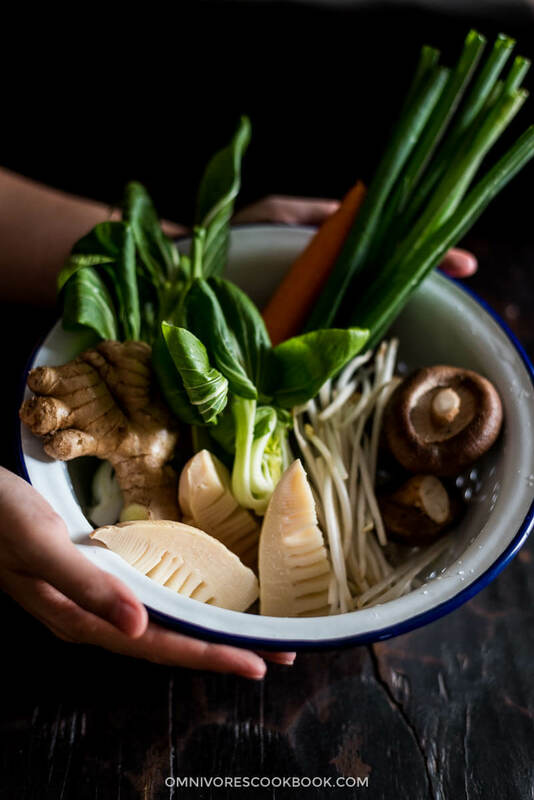 My husband was quite impressed with the flavor and we both enjoyed the different textures of the different ingredients in the dish: noodles, green onions, fresh mushrooms, baby bok choy, and carrot. I didn’t have any bamboo shoots or bean sprouts on hand so I added in about 7 or 8 ounces of pre-cooked tofu. Hi Beth, I’m glad you and your husband like the dish! Re oyster sauce replacement – I think the best replacement is hoisin sauce. Oyster sauce adds sweetness and starchiness to the sauce, so you do need to replace it with something similar. Alternatively, you might able to get away with added soy sauce, Shaoxing wine, sugar and cornstarch. Although it’s hard for me to provide a quantity since it might vary depending on the recipe. If you use hoisin sauce as a replacement, I might add less sugar since hoisin is quite sweet. Hi Maggie and thanks for your reply and advice re oyster sauce replacement. I think I’d be totally fine using oyster sauce in small amounts in other recipes but it’s good to know that hoisin sauce would be an acceptable substitute. Years ago our natural food health store carried their own brand of hoisin sauce and it was sooooo good. Sadly they discontinued it and I have yet to find a store-bought hoisin sauce that is any good and I’ve been without hoisin sauce for years now 🙁 My most recent hoisin sauce purchase was Sun Luck brand, and while the thickness and mouth feel was quite good, it was really way too sweet and would be strange to use in a savory dish. I would have known that had I checked the ingredient list before I bought it as sugar, molasses, pumpkin, and some other sweetish ingredient were listed among the first ingredients. Anyway, to make a long rambling story short, I’ll be definitely trying your homemade hoisin sauce recipe soonish. I’m sure there’s a typo in the recipe. 1 whole teaspoon white pepper is pretty crazy. Hi Christopher, I do like to make the dish quite spicy. You can totally halve the white pepper or only use 1/4 teaspoon if you prefer a less spicy dish. 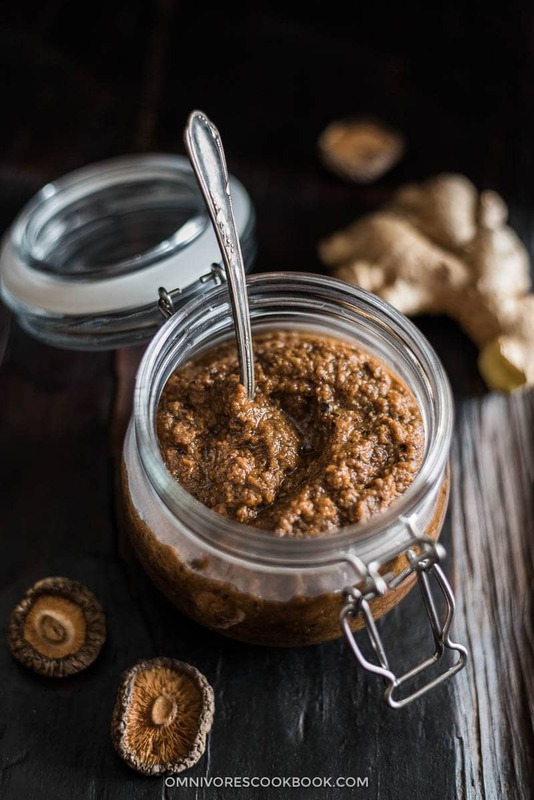 This recipe calls for a Tbsp of minced ginger, but it isn’t mentioned in the instructions. Was this a mistake? Hi Dustin, sorry about the confusion! I just updated the recipe and included the ginger in the recipe instructions.